Guernsey FC's Isthmian League play-off hopes took another blow as they went down 4-1 at home to Hastings United to suffer a fifth-successive defeat. Billy Medlock's excellent 30-yard free-kick gave Hastings a 21st-minute lead before Zac Attwood doubled the advantage 15 minutes later. Guernsey's Ross Allen pulled one back from the penalty spot after the break. But Ollie Rowe increased the lead with 20 minutes left before Sean Ray's header from a corner sealed the win. 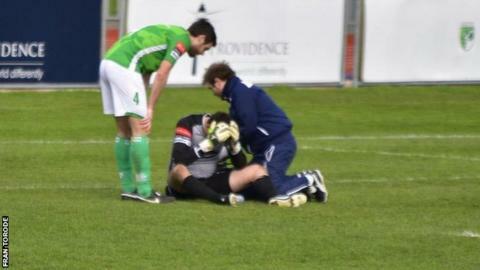 The Green Lions loss was further compounded by an injury to goalkeeper Chris Tardif. The former Oxford United and Portsmouth stopper had to be taken off with 15 minutes left, with defender Tom Strawbridge being forced to go in goal.